The FREE system base layer consists of an undershirt and drawers. The undershirt and drawers are constructed with a lightweight moisture wicking and breathable Lycra mesh fabric made with DuPont Nomex fiber. This base layer provides maximum comfort and excellent recovery properties in hot climate, and can be worn under other layers like the mid-weight shirt and drawers for additional protection for cold weather. 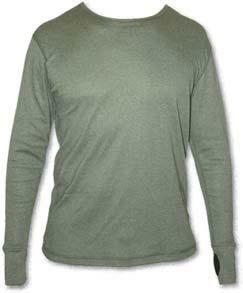 The undershirt and drawers are available in desert sand or foliage green.